Preheat the oven to 200ºC, gas mark 6. In a pan combine the chopped tomatoes, oregano, garlic and 1 tsp of the oil, season and simmer over a medium heat for 10 minutes until thickened, stirring occasionally. Meanwhile, toss the aubergine, pepper and onion in the remaining oil and season. Arrange over the base of a roasting tin and cook in the oven for 10 minutes. In a 2 litre ovenproof dish, layer up the roasted vegetables with the sliced potatoes and tomato sauce, seasoning each layer. Finish with a layer of potatoes, and then tomato sauce. Cover with kitchen foil. Bake for 45–50 minutes until the vegetables are tender and the top is golden, removing the kitchen foil half way through cooking. Leave to stand for 5 minutes for the flavours to settle before serving with crusty bread and a salad. 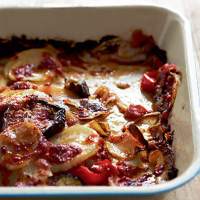 This flavoursome tomate-based, rustic bake is perfectly suited to a juicy yet full-bodied Italian red such as the Poggiotondo, Cerro del Masso 2006 Chianti, Tuscany, Italy, also suitable for vegetarians. Tumbet is the Majorcan name for this dish. This recipe was first published in August 2009.